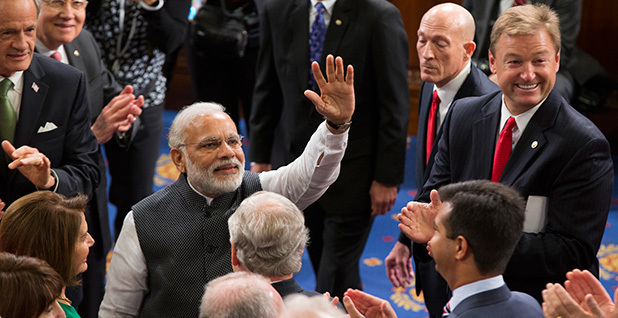 Indian Prime Minister Narendra Modi waves before addressing a joint meeting of Congress this week. Photo courtesy of AP Images. Much has been made about the "bromance" between President Obama and Narendra Modi, but in some ways, the Indian prime minister's political leanings are more in line with the Republican-led Congress he addressed Wednesday than with the Democratic president. Modi and his Bharatiya Janata Party, or BJP, combine religious conservatism with support for free-market policies over a concentration of power in India's massive bureaucracy. The party has a history of hostility to Muslims that would put Donald Trump to shame. In remarks before the joint chambers of Congress on Wednesday as Indian political minorities picketed outside, Modi honored both countries' constitutions, trade relationship, and military and security cooperation. When it comes to defense exercises, he said, "India exercises with the United States more than we do with any other partner." But Modi also told lawmakers who have blasted last year's Paris climate deal that India's work with the Obama administration to help broker the agreement was one of the cornerstones of the U.S.-India relationship. "We are working together not just for a better future for ourselves, but for the whole world," he said. Modi's appearance came a day after he had his seventh meeting with Obama, which is likely to be their last state visit before the president leaves office next year. The two have forged a personal friendship that has translated into collaborations on issues including climate change, and this visit produced a joint goal of setting goals of early entry into force for the Paris Agreement and an amendment this year to the Montreal Protocol on Substances that Deplete the Ozone Layer to phase down short-lived climate super-pollutants used in cooling and refrigeration. "I think the shadow of the president's departure was hanging over them," he said. Andrew Light, a senior fellow at the World Resources Institute who previously served in the State Department, said he hoped it wasn't lost on the Republican lawmakers that Modi is a conservative who prioritizes climate change. "It's important for our political process on this issue that conservatives project the message that they do not see this as an ideological issue," he said. He also noted that Modi named other venues besides the U.N. Framework Convention on Climate Change where India and the United States have engaged on climate, showing that "whenever leaders of the world [are] meeting together to discuss the important issues of the day," climate change is on that list. Republicans responded little to Modi's environmental comments. Alaska Sen. Dan Sullivan (R) said in a statement, "It's critical that we continue to forge and foster partnerships with allies like these." He said he looks forward to collaborating with India on energy supply. Perhaps appealing to fellow religious conservatives, Modi told Congress that his concern for the environment "is a part of our ancient belief." "Modi has a very deep spiritual commitment to environmental issues, and I think that comes out of his Hindu nationalism," said Light, who co-led the U.S.-India Joint Working Group on Combating Climate Change during a stint at the State Department that ended this year. Modi frequently links Hindu theology to climate change and the environment. His first gesture after being elected prime minister in 2014 was to thank "Mother Ganga," the spiritually significant but polluted Ganges River, for choosing him to clean her. While still serving as chief minister of the western state of Gujarat, he authored a book called "Convenient Action: Gujarat's Response to Challenges of Climate Change," which made frequent references to Hindu spirituality. Written in English -- which analysts said showed the desire for an international audience -- the book was an explicit response to former U.S. Vice President Al Gore's film "An Inconvenient Truth." India's nationally determined contribution (NDC) to Paris -- which featured a promise that India will use 100 gigawatts of solar power by 2022 -- began with a line from the Yajur Veda, an ancient collection of mantras: "Unto Heaven be Peace, Unto the Sky and the Earth be Peace, Peace be unto the Water, Unto the Herbs and Trees be Peace." "Clean energy is an article of faith for the prime minister," said Harsh Vardhan, Indian minister of science and technology, at a briefing at the Clean Energy Ministerial last week in San Francisco. India also promised to double its clean energy research and development funding from $72 million to $145 million by 2019 as part of the 20-nation Mission Innovation pact -- so named by Modi himself, energy leaders said. "We feel it's a historic thing," Vardhan said, "something that will written in the history chapters in golden letters in future times." Rick Rossow of the Center for Strategic and International Studies said Modi's business-friendly attitude is fairly unusual among state officials in India, where there is political pressure to focus on social safety net issues. Asked why foreign investors should locate in his state after the violence, Modi "spun a story about how development was the key to equality and prosperity in his state, and it was unlike anything that I'd heard," Rossow said. Modi would go on to use his party's solid foothold in Gujarat to push through reforms to the state's distribution system that freed up resources that could be invested in renewable energy, displacing less expensive coal. But now, as prime minister, Modi has less direct control over the power grid, Rossow said. Electric power in India falls squarely under the purview of the states, and with only nine of India's 29 states under BJP leadership, Modi will have difficulty guaranteeing his ambitious Paris commitment. "I don't know that they have a really strong road map about how to make it happen," he said. The federal government can provide incentives, or condition funding for grid upgrades and improvements on states' taking certain steps to improve efficiency or renewables penetration. While the government is taking some of those steps, they only go so far, said Rossow. "It's not going to be easy, but I think things are moving in the right direction," she said. "And I think in terms of personality and will, Prime Minister Modi has a very strong personality and is very persuasive in India." Jaiswal said Modi's pro-business stance is an asset, especially in the wake of Paris, when governments hope the private sector will provide the capital and technology to deliver on their commitments. "There is no way we are going to meet the clean energy targets or the overall targets from the Paris Agreement without full business engagement," she said. The U.S.-India agreement struck this week suggested that India would ratify the Paris deal this year but stopped just short of a pledge. A signature from the world's third-largest-emitting national economy is considered key to putting the deal into effect this year, since the accord will only go live after countries responsible for 55 percent of the world's greenhouse gas emissions join. Meanwhile, an agreement on parameters for an amendment under the Montreal Protocol to curb hydrofluorocarbons is a significant shift from India's historic opposition to phasing out the potent greenhouse gas. Former administration officials say it is likely that this shift originated with Modi rather than India's bureaucracy (ClimateWire, June 8). Yet despite the concern Modi has expressed for climate change, the country will continue to increase its coal consumption for the foreseeable future even as the percentage of energy it draws from coal goes down. Vardhan said more coal use is a necessary byproduct of India's much-needed economic development. "You have to strike a balance between what is ideal and what is practical," he said.